A team of researchers at the University of Georgia has found a way to use the CRISPR-Cas9 gene editing tool on reptiles. In their paper uploaded to the bioRxiv preprint server, the group describes the technique they developed and how well it worked on test lizards. CRISPR Cas-9 has been used in a wide variety of experiments over the past couple of decades as scientists attempt to learn more about the procedure itself, how well it works, and possible applications for its use. 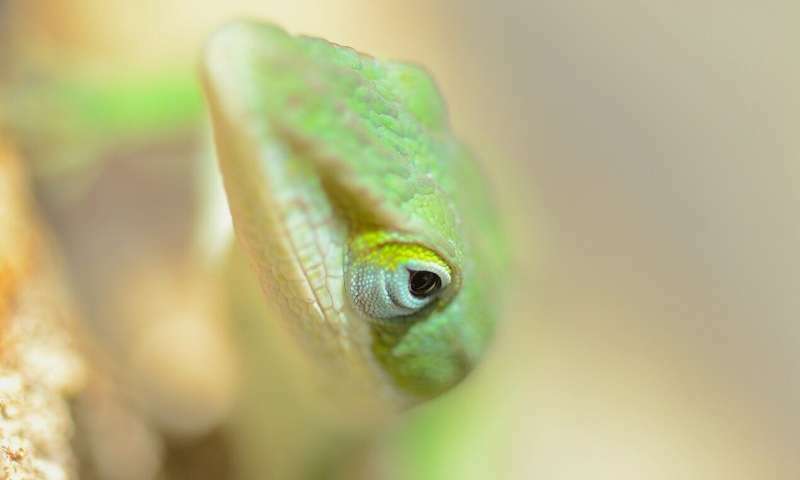 But early on, researchers suggested that CRISPR could not be used with reptiles because of their unique reproductive systems—anole females, for example, store sperm for use when it is most convenient, making it difficult if not impossible to time the injection of the CRISPR Cas-9 tool. There is also the problem of inserting a needle through an eggshell without damaging it and preventing the embryo from developing. But difficult does not mean impossible, as the team in Georgia has found—they developed a successful workaround to edit cells in several lizards using CRISPR Cas-9. To use CRISPR Cas-9 on lizards, the researchers cut open several test anole females and injected the editing tool directly into eggs before fertilization, while they were still in the mother's ovaries, and then allowed nature to take its course. In all, the team injected the editing tool into 146 eggs in 21 lizards. In their experiments CRISPR Cas-9 had been programmed to edit the tyrosinase gene, which is responsible for determining what color the lizard will be—when it is deactivated, the lizard will be an albino. The researchers report that the editing technique was successful four times—four albino anoles were born. The researchers suggest their technique should work on other species of lizard as well. In taking a closer look at what had actually transpired with the albino anoles, the researchers found that the offspring had edited genes from both parents—this meant that CRISPR Cas-9 had remained active in the female longer than expected, resulting in changes to paternal genes after fertilization had already happened. What about working on Chameleons?